Goulash from the kitchen range for a big family celebration. Peel an onion, chop it finely. 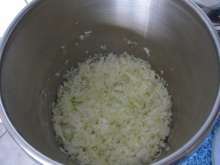 Melt lard in a large pot, add onion and stir for about 10 minutes. Pour water in and braise onion for the next 10 minutes covered while stirring occasionally. Wash the meat and cut it into cubes. Add it to the onion, stir until the meat becomes sauteed. 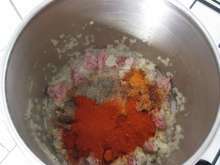 Set the pot aside and stir in salt and spices. 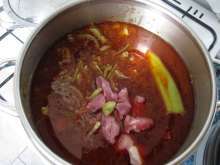 Pour the meat over with warm water and cook covered 60 minutes while stirring occasionally. Wash the meat and cut it into cubes. 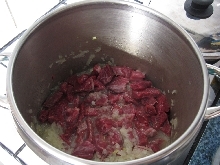 Add it to beef together with pressed garlic and washed, cored green peppers, one as a whole and the rest chopped. Cook everything together for 30 more minutes. Peel the potatoes and wash them. 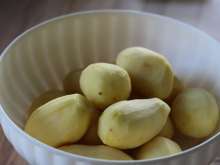 Put aside one large potato into a bowl with water. 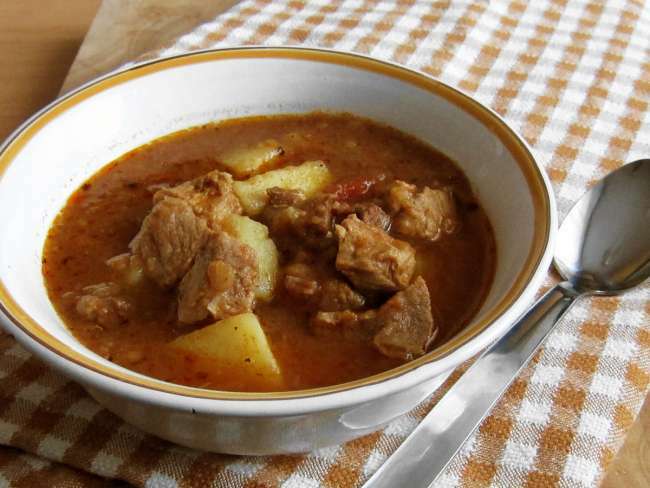 Once the meat is almost done, cut the remaining potatoes into cubes and put them in the pot. Chop tomatoes and together with tomato paste from the can add them to the meat. Cook for about 20 minutes until potatoes become tender. At the end add into goulash shredded potato that we previously put aside. 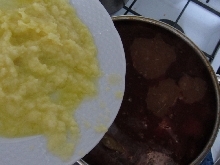 Season with one more pressed garlic, salt, add to your taste hot pepper paste and marjoram. Bring to boil and serve the first - goulash tasting portion.